Inside Tip: Do you enjoy shopping in the winter with a cup of coffee, hand in hand? Visit these wonderful shops and save with our low winter rates! Use that money you saved for some special Santa Fe purchases. 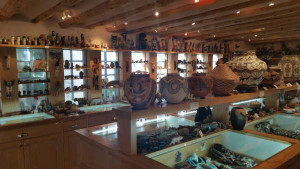 The gift shops at Santa Fe’s museums are great options for shopping. The two on Museum Hill operated by the Museum of New Mexico Foundation deserve special mention. 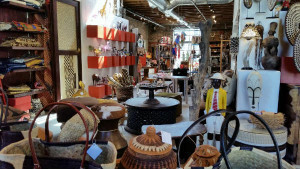 A purchase at these shops enhances the livelihood of artisans from New Mexico and around the world. For more than 50 years, Doodlet’s has been delighting everyone who steps through their door. 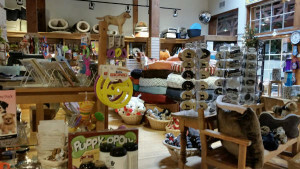 This old time gift shop is crammed full of unusual gifts that will make any recipient smile! If you have someone that is hard to buy for, head to Doodlet’s across the street from Café Pasqual’s. 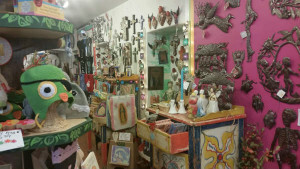 This magical place is my Mom’s favorite shop in Santa Fe. Filled with fun and whimsy, you’ll get lost in the campy, retro, irreverent, and fun merchandise they stock. Here you’ll find shiny pot-metal Milagros, gag gifts, wonderful and unique books, greeting cards, silly gags, old fashioned candies (do you remember Necco Wafers? ), buttons, jewelry, and thoughtful Santa Fe treasures. A wonderful stop when you have stockings to stuff for the holidays! Don’t miss it! 120 Don Gaspar just blocks off the Plaza. Feel like you’ve stepped into an Asian or Arabian bazaar at this warehouse style emporium of art and sculpture, overflowing with gorgeous Afghan rugs, Tibetan furniture, mirrors, pillows, and large architectural pieces. During their 15 years living in Afghanistan, the Serets developed a unique style of carpet, fabric, and furniture design becoming a top resource to designers such as Anne Klein, Oscar de la Renta, Angelo Donghia, and others. Need an impressive architectural element for your home or yard? How about a giant stone elephant or huge teak gate? Their back-yard is full of giant treasures waiting for a home. Getting such treasures to your home is easier said than done, but it’s fun just to browse and dream also! Come browse, buy or dream on Santa Fe’s own Silk Road. 224 Galisteo Street, seretandsons.org. Santa Fe has been a trading post for nearly 1000 years as it was centrally located between the buffalo-hunting tribes of the Great Plains and the Indians of Mexico. After the arrival of the Spanish and the U.S. West’s subsequent development, Santa Fe continued to be a key shopping destination on the Santa Fe Trail, one of the world’s most historical and colorful trade routes. Today, the trading legacy remains strong. 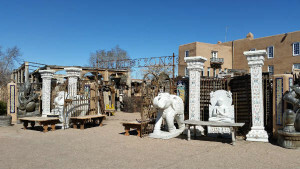 Santa Fe truly offers an exciting mix of shopping for both old and new.